Dimensions (HxWxD): 4" x 3" x 2"
This cool & creamy colored Albite Matrix has beautiful brilliant & shining small crystal points which emerge from the crevices between the main two sections of matrix & also climbs their way up to the top where druzy Braziliantes cluster & spark. These lovely Brazilianite points on albite matrix from Minas Gerais, Brazil displays good gold-green coloring & peach tones from the presence of iron in the matrix. This piece is really cool, crystals emerging from rock, helping us to understand the manner in which these crystals form in the earth. And, this piece is the perfect size to hold in the hand or place on your altar! This piece would be a good way to investigate & experience Brazilianite without having to invest a lot of money. A great starter gem! 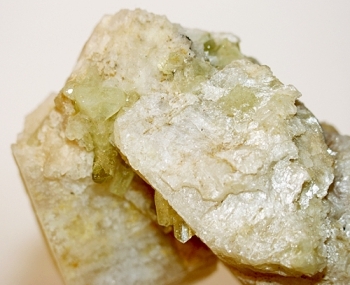 Brazilianite, sodium aluminum phosphate, is a moderately hard stone made up of short prismatic forms. It is a gemmy stone with good translucence and is used in the jewelry industry because of its brilliance & luster. It was named after Brazil a relatively short time ago when it was first discovered there in 1944. Deposits have also been found in New Hampshire in the USA. Albite is a type of feldspar, which manifests as tabular and plate-like crystals. Crystal healers and meditators have used albite to promote a sense of flow in one's life, to improve one's diplomatic skills and to purify the physical body. You can see the luminous & pearl like luster in places on this specimen. This is a new stone for us here at Satya Center, and both of us have very much enjoyed meditating with Brazilianite. Like several of the other yellow-green gemstones, such as helidor, amblygonite, apatite & peridot, Brazilianite seems to work with a high vibration, quickening the heart, solar plexus & third eye & crown chakras. It is a deeply replenishing stone, offering a good chi boost! 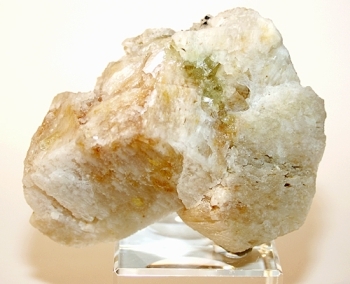 Use this wonderful specimen in meditation, vibrational healing & any energy work for great results!Lightworkers will want to place this stone on their client's heart or solar plexus chakra during energy treatments to facilitate physical restoration and energize the individual's will forces enabling them to move through obstacles which prevent them from connecting with Higher Will, Higher Mind & Divine Guidance. Meditators will find that this stone will enable them to go deeply into a meditative state while simultaneously enhancing their heart & mind connection and strengthening their Life Forces. Lightworkers who have yet to discover the powerful energy signature of Brazilianite will be amazed at the way this stone increases the flow of prana, enhances will forces, vitalize the physical body, connects intellect with Higher Mind & therefore, assists in integrating body, heart and mind. Use this powerful crystal with loving wisdom and respect -- its long journey in the Earth that has lasted for many long historical cycles. This crystal is a love-gift from the Divine Mother. Net Weight is 282 gms. or 9.95 oz.